Jings, crivvens and help ma boab! Thon Grambler’s awfy late this week! Michty me! [Nurse, I think it’s time to increase the medication. - Ed.] No, no, let me explain. As anyone who comes from Scotland will have realised, those first few words were written as if being spoken by one of this country’s most famous comic strip creations - Oor Wullie. Those of you who have never heard of him may be thinking that it is the sad tale of conjoined twins. 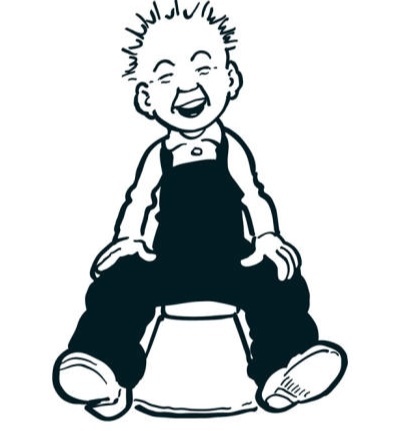 No, Oor Wullie, along with The Broons, has appeared in the ‘fun section’ of the Sunday Post since 1937. Why am I telling you this? Well, the reason for this week’s tardy publication is that Mrs G, myself and a lovely couple we know visited Dundee this week to follow ‘Oor Wullie’s Bucket Trail’. You’re none the wiser, are you? I will try to enlighten you. Have you ever visited a town to see identical resin-based statues placed in various locations? I say identical; the statues are identically shaped, but each is painted in a unique manner. Local artists tend to be given a theme and create artwork to suit. The first time I visited a town with this phenomenon was a few years ago when Mrs G and I spent some time in Chester. We didn’t understand it at the time, but every so often we would see a statue of a rhinoceros. Each was painted differently. More recently Hamilton had a collection of heavy horses placed in prime locations around the town. Not real ones, you understand. Resin ones. I don’t know what happened to Chester’s rhinos, but I know that Hamilton’s horses were auctioned off after a period of time had passed; the money being given to charity. This was what the bucket trail was about. A charity called the ARCHIE foundation, which raises funds to assist in the healthcare of sick children in the north east of Scotland, linked up with Dundee’s council and D.C. Thomson (creators of Oor Wullie and based in Dundee) to come up with a trail of Oor Wullie statues around Dundee and surrounding areas. Unlike the previous places I mentioned, this was advertised nationally and actual maps of the trail were printed. Also, there weren’t just a dozen or so statues; there were 55. We were there for two days and managed to see less than half. It was great fun though and the local artists who had been tasked with decorating a particular statue had come up with some interesting ideas. One that I particularly liked was the one that was called Oor Bowie, Your Bowie, A’body’s Bowie as a tribute to the thin white duke himself. Like all the statues, this one was sat on a bucket, but instead of the usual attire of dungarees, it was dressed in the style of Ziggy Stardust complete with the zigzag flash on its face. Anyway, the charity should get a lot from this excellent scheme, as indeed will the city of Dundee. Many people (us included) have headed to the city of jam, jute and journalism simply to follow the trail; the numbers of tourists to the city must have increased drastically. Where the charity will really benefit is at the end of the enterprise when all 55 statues will be auctioned off. Before I end this little section, I will tell you that I learned something on this visit to Dundee. As a kid, I was an avid reader of the D.C. Thomson comics the Beano and the Dandy. I could tell you all about the adventures of Korky the Cat, Dennis the Menace, Little Plum, the Three Bears and Roger the Dodger. The middle two pages of the Beano were reserved for the classroom antics of the Bash Street Kids (Smiffy and Plug were my favourite characters). Well, on my visit to Dundee I learned that there is an actual road called Bash Street. And I always thought it was a figment of the cartoonist’s imagination. All I can say is jings, crivvens and help ma boab! Do you recall my (g)ramble a few weeks back when I told the tale of Mrs G and I paying a visit to our local bank? You may remember that the cashier refused to take a bag full of money which we wanted to pay into our account so that we could donate the money to The Grambler’s Kick Cancer’s Backside Fund. Well, we were a bit miffed at the treatment we had received so decided to take our complaint a step further. One email to the ceo of this particular bank was soon winging its way through the ether. The next morning a reply to that message was in our in box. The top man at the complaints department had been given the job of placating this pair of old grumps. I expected him to argue the case in favour of his employee but, no, he was very much on our side and used expressions such as ‘jobsworth’ and ‘lacking common sense’ to describe the cashier in question. Incidentally, not everyone is aware of the term jobsworth so let me enlighten you. It is a word used to describe the sort of officious bas... individual who insists that rules are rules and must be carried out to the letter; there can be absolutely no deviation from this. Usually, it is somebody who has been given a job with a little bit of authority attached to it and who enjoys the power that it gives him or her over any member of the public who is trying to avoid too much ‘red tape’. The jobsworth is the sort who would not deviate from a rule no matter how daft that rule may be and would never attempt any easier way of carrying out any task. When dealing with the public, this person in authority invariably uses the expression, ‘more than my job’s worth’, hence the name. Apparently, it first gained popular recognition on the Esther Rantzen fronted programme called That’s Life. Any road up, where am I heading with this? This complaints manager guy was extremely apologetic for the way we had been treated and we felt it proved that we were justified in making our complaint. Is that it, you may be asking. That wasn’t particularly interesting, you are probably thinking. And you’d be right. But there is more. Within four hours of this gentleman first contacting us, the Grambler’s Kick Cancer’s Backside Fund had benefited by 100 quids. It was a donation from the bank. Sometimes, it pays to moan a bit. The Tykes took the lead even before getting a shot on target, with captain Conor Hourihane's effort from 25 yards coming off the post before rebounding off Rams goalkeeper Scott ‘Kit’ Carson into the net. Alfie Mawson met a Hourihane free-kick to head home a second after the break. Ryan Kent also hit the post for Barnsley. Rovers were poor before the break and trailed to James Collins' 26th-minute tap-in. Doncaster captain James Coppinger rescued a point for his side when he twisted to fire home Matty Blair's corner in the 49th minute. Crawley started on the front foot and deservedly went ahead when Collins tapped home Jason ‘Pato’ Banton's cross. Coppinger fired a free-kick just wide for a disjointed home side, while Rovers' Tommy ‘Dizzy’ Rowe saw a goalbound effort from close range blocked. The visitors offered more of a threat and Banton saw an effort deflected just wide, while Enzio Boldewijn struck a shot onto the roof of the net from the angle of the box. Coppinger gave the home side a much-needed confidence boost when he met Blair's corner from the right with a superb first-time finish from the edge of the box. Rovers pressed for a winner and went close through Blair, John ‘Mary’ Marquis and Andy ‘Moon River’ Williams. The Sons defender Mark Docherty converted confidently after Gregor Buchanan was judged to have been shoved in the box at a corner kick. Ryan Stevenson's free-kick from the edge of the box had earlier hit the crossbar for the hosts. United struggled to turn possession into chances but came close when Jamie Robson's volley was saved. Home goalkeeper Alan Martin was called upon again late on to deny Coll Donaldson a leveller. Ach weel, as Wullie might say. There’s always next week. But not a this week. Too late, do you see? Teaser time. Yay! Last week I asked you which former Manchester United striker was so in awe of Alan Shearer, that he slept in a Newcastle United shirt. The answer is Dimitar Berbatov. Did anyone get that one? Too difficult? Let’s have an easier one for this week. Here’s a Premiershit question for you. As you all know, many Premiershit players come from abroad these days; over the years, three Premiershit clubs have employed more than 125 foreign players. Not surprisingly, Chelsea top this list having had 141 overseas players on the books at one time or another. I thought that Manchester City would have been next, but I was wrong; they are at number three, pop pickers. So, which club comes in at number two? Not arf! And finally, Cyril? And finally Esther, I am indebted to a Mr S. Lee who, I am guessing, but I could be wrong, is not the biggest fan of birthday celebrant Joe Pasquale. Click here .